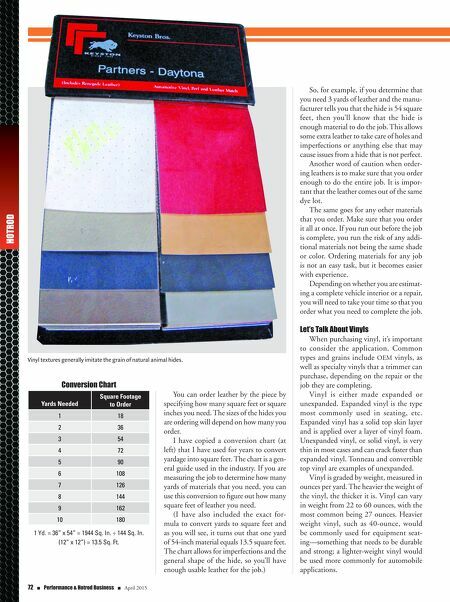 72 n Performance & Hotrod Business n April 2015 HOTROD You can order leather by the piece by specifying how many square feet or square inches you need. The sizes of the hides you are ordering will depend on how many you order. I have copied a conversion chart (at left) that I have used for years to convert yardage into square feet. The chart is a gen- eral guide used in the industry. If you are measuring the job to determine how many yards of materials that you need, you can use this conversion to figure out how many square feet of leather you need. (I have also included the exact for- mula to convert yards to square feet and as you will see, it turns out that one yard of 54-inch material equals 13.5 square feet. The chart allows for imperfections and the general shape of the hide, so you'll have enough usable leather for the job.) Conversion Chart Yards Needed Square Footage to Order 1 18 2 36 3 54 4 72 5 90 6 108 7 126 8 144 9 162 10 180 1 Yd. = 36" x 54" = 1944 Sq. In. ÷ 144 Sq. In. (12" x 12") = 13.5 Sq. Ft. Vinyl textures generally imitate the grain of natural animal hides. So, for example, if you determine that you need 3 yards of leather and the manu- facturer tells you that the hide is 54 square feet, then you'll know that the hide is enough material to do the job. This allows some extra leather to take care of holes and imperfections or anything else that may cause issues from a hide that is not perfect. 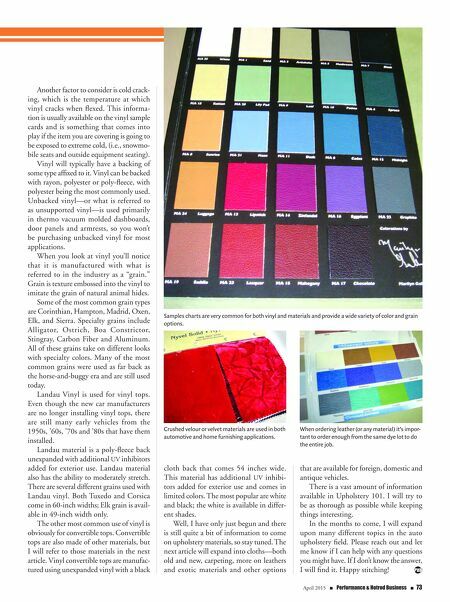 Another word of caution when order- ing leathers is to make sure that you order enough to do the entire job. It is impor- tant that the leather comes out of the same dye lot. The same goes for any other materials that you order. Make sure that you order it all at once. If you run out before the job is complete, you run the risk of any addi- tional materials not being the same shade or color. Ordering materials for any job is not an easy task, but it becomes easier with experience. Depending on whether you are estimat- ing a complete vehicle interior or a repair, you will need to take your time so that you order what you need to complete the job. Let's Talk About Vinyls When purchasing vinyl, it's important to consider the application. Common types and grains include OEM vinyls, as well as specialty vinyls that a trimmer can purchase, depending on the repair or the job they are completing. Vinyl is either made expanded or unexpanded. Expanded vinyl is the type most commonly used in seating, etc. Expanded vinyl has a solid top skin layer and is applied over a layer of vinyl foam. Unexpanded vinyl, or solid vinyl, is very thin in most cases and can crack faster than expanded vinyl. Tonneau and convertible top vinyl are examples of unexpanded. Vinyl is graded by weight, measured in ounces per yard. The heavier the weight of the vinyl, the thicker it is. Vinyl can vary in weight from 22 to 60 ounces, with the most common being 27 ounces. Heavier weight vinyl, such as 40-ounce, would be commonly used for equipment seat- ing—something that needs to be durable and strong; a lighter-weight vinyl would be used more commonly for automobile applications.